Wired News has just posted some coverage of the 12th Annual World Congress on Intelligent Transport Systems, being held in San Francisco this week. GM equipped two cars with wireless transponders that broadcast various pieces of information such as speed and braking status to nearby cars. When one car brakes in front of another, even one down the road and out of sight, a small icon on the dashboard of the trailing vehicle indicates a stopped automobile up ahead. On a test track at SBC Park, home of the Giants, a black BMW sport sedan splashing and skidding through a big puddle immediately signaled the silver vehicle behind it to watch out. "Slippery road 50 feet ahead," flashed the message on a display screen in the silver car. 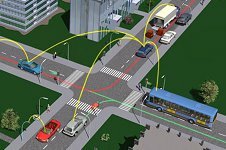 There is tremendous potential in this kind of automated communication between vehicles, particularly when one car can signal to others that an emergency system such as ABS or an airbag has been triggered. Previous posts have noted the Japanese Advanced Safety Vehicles effort, coordinated by the Japanese government. European manufacturers kicked off a similar initiative, called Car2Car, with a consortium involving BMW, DaimlerChrylser, Fiat, Renault and Volkswagen Group, plus major parts suppliers – including Japanese firms such as NEC.